Welcome to to our 28th year of REAL BAD, 6th year of REACH, & 4th year of RECOVERY. The best parties of the year are also the most charitable. This year’s Working Group is already hard at work planning the parties. A year’s worth of work, passion, love and commitment blend together to give our Circle of Friends unforgettable nights of fun as well as opportunities to actively participate in our community. We are particularly excited to begin our non profit beneficiary nomination process. This is where YOU come in. We need your help to nominate possible organizations. We urge you to forward names of organizations you would like to see benefit. You can even nominate more than one organization, so if you know of any that fit the mission statement of the Grass Roots Gay Rights Foundation, we want to hear from you. The Grass Roots Gay Rights Foundation changes lives by supporting organizations that promote a happy, healthy, and connected LGBT community. Nominated organizations need to be official non-profits and be in line with our mission statement. 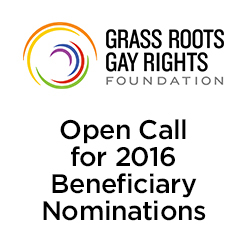 PLEASE EMAIL YOUR NOMINATIONS TO davidh@grassrootsgayrights.org. You should include the name of the organization, their website, a contact name if you have one, and any other information that will help us in determining if they are a good match for our beneficiary selection process. You can read about this process on our website here.